This is another good hole. 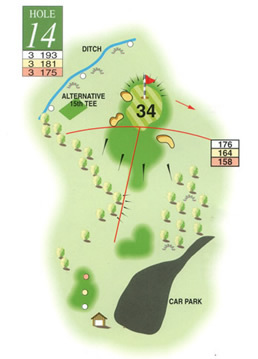 A par 3 measuring 193 yards from the back tee which can on occasions only require a 9 iron with a strong tailwind assisting or as much as a driver into an easterly. Choice of club is again crucial as the contours of the green carry the ball right to left once on the hardened playing surface. The hole is downhill from the tee and the ball can run well in summer but the three well-situated bunkers right and left frequently catch the errant shot. The green itself is long and undulating and runs uphill over a ridge which then falls away right to left so pace is crucial. Depending where the pin is sited can make for an interesting putting contest.